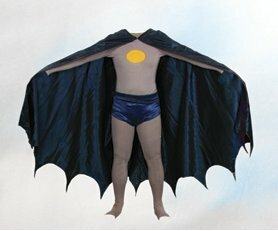 Adam West's personal Batman cape worn in Batman. 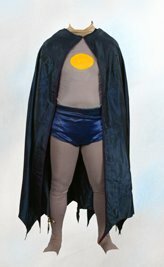 (ABC-TV, 1966-68) This is the original "cape" as worn by the Caped Crusader - a silk satin blue cape cut in the classic "bat" style with scalloped lower hem (some of these exhibit extensive wear from production use and age). West himself states that many times during the rehearsal and filming of the fight scenes, the long cape would be torn. The cape also has four internal snaps to fit the cowl. Some of the seams exhibit stress, but overall the cape remains in very good screen-used condition. Comes directly from Adam West's personal collection, and is accompanied with his signed letter of authenticity. (*) Photos & info courtsey of Profiles in History!